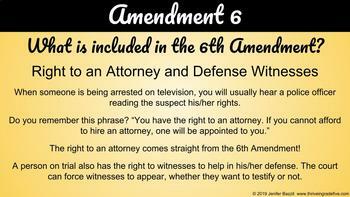 The Bill of Rights is so much fun to teach! 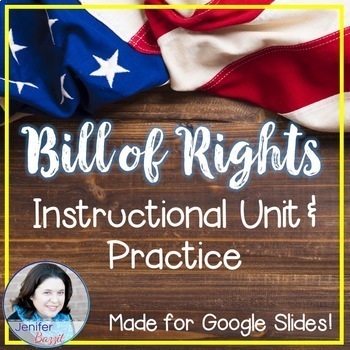 This Google Slides activity provides instruction on each of the 10 Amendments that make up the Bill of Rights. 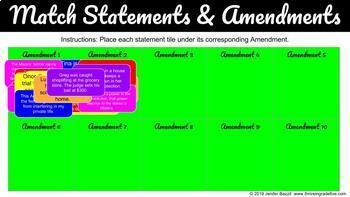 Along with instructional slides, I have included one interactive slide per Amendment to allow students to review the information and think critically about each Amendment. Please note: When you click "Download," you will be downloading a PDF that contains the link for this Google Slides activity AND instructions for how to use the resource on Google Classroom. This Google Slides activity is text-editable. The images are saved as backgrounds and cannot be changed. You may remove slides and change transitions. If you need help (or a refresher) on how to use Google apps in your classroom, please click here to read my blog post. You'll find instructions, screencasts, and extension ideas! Remember to follow my store. You will receive new product updates and sales alerts. Simply click the "Follow Me" star at the top of this page! ©2019 Jenifer Bazzit. All rights reserved. Before I became a teacher-author, I wasn’t familiar with copyright law. You may not have the first clue about copyright and that’s ok! 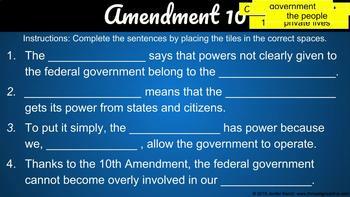 To simplify things, please understand that you have purchased ONE license to use this product in your classroom. This product belongs to me and is copyrighted under my name, so you may not share it freely, email it to coworkers, or upload it to any website, including your school website, district website, blog, or an educational-sharing site. I appreciate your consideration!